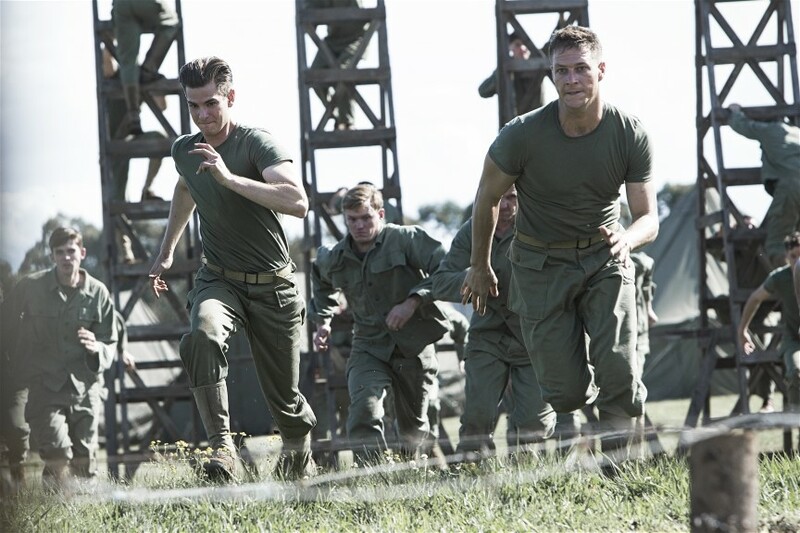 Andrew Garfield and Luke Bracey in HACKSAW RIDGE. Mel Gibson’s been on what seems like an eternal quest for redemption since uttering anti-Semitic and sexist ravings while being arrested for driving while under the influence. It’s been an extremely tough road back and, to be quite honest, given the nature of his transgressions, it should have been. But now, given the film that is HACKSAW RIDGE, a movie that’s right up Gibson’s alley, he’s likely to find new acclaim – including from this corner. HACKSAW, based on the story of Desmond T. Doss (Andrew Garfield), joins a list of gripping, gritty war movies such as SAVING PRIVATE RYAN to tell a story in spectacular fashion. And this particular subject is right up Gibson’s alley. It blends Gibson’s interest in the spiritual and religion (see THE PASSION OF THE CHRIST) along with another interest – war films (Gibson directed BRAVEHEART and starred in WE WERE SOLDIERS). The result is a thoroughly entertaining film that inspires, and features some of the best filmed war footage seen on screen in quite some time. Doss, a Medal of Honor winner, represents an unusual case for the World War II era in which he grew up. Compelled by patriotism to enlist to fight in the war, as a Seventh-Day Adventist he was a conscientious objector. Doss joined up to save lives as an army medic, not take them. For that reason, despite going into battle he didn’t carry a gun. Of course during that time he was ridiculed by his fellow soldiers. Commanding officers want him drummed out of the service. He’s beaten and his manhood is questioned. Despite all of that he remains undaunted in sense of duty to God, country, and his fellow soldiers. He’s shipped to battle in Okinawa where the battle of Hacksaw Ridge takes place. The Army needs to secure the area and go into battle, eventually taking heavy losses. It’s there that Doss’ heroism comes to the forefront. As one of the few medics in the battle he’s tasked with administering aid to colleagues. What no one realizes is just how devoted and brave he is. After his battalion takes heavy casualties and retreats, Doss stays to rescue men. With a film that could be completely melodramatic and overwrought, HACKSAW RIDGE strikes the right tone. It’s a story that’s tough to fathom given what’s at stake, but Gibson skillfully of pulls it off, exploring every aspect of Doss’ life. What, however, will be remembered are the battle scenes that reveal much about the man. Garfield brings Doss to vivid life, helping to see what could possibly make what someone with such deeply held convictions think. What makes the performance so strong, however, is that it’s wonderfully understated in that as the viewer you’d have little idea what Doss is capable. In short: Garfield inhabits the role. Another performance of note: Hugo Weaving as Doss’ father is compelling as an internally broken man, addled by bad memories and alcohol. Those aspects of the film make it worth seeing.